Between 1995 and 1998, PBS fed kids classic tales like Ivanhoe and The Legend of Sleepy Hollow through a wise-cracking dog named Wishbone. The imaginative Jack Russell Terrier inserted himself into the plots of countless books and always found a way to connect even the most esoteric tome to the real-life problems of his owner, Ellen Talbot, and her teenage son, Joe. But how did PBS pull off this canine-focused, kiddie Masterpiece Theatre? Find out which famous faces appeared on the show and how Wishbone saved college GPAs with these 10 facts. 1. THE CREATOR WAS INSPIRED BY HIS OWN JACK RUSSELL TERRIER. 2. FIVE DOGS PLAYED WISHBONE. The coveted role of Wishbone went to a Los Angeles-based pup named Soccer. But Soccer couldn’t be in every shot. Although he did the bulk of the screen work, the studio also employed three other Jack Russell Terriers for stunts (Phoebe, Slugger, and Shiner) and another just for publicity stills (Bear). 3. THE MAIN DOG WON THE PART WITH HIS BACKFLIP. According to an “interview” Soccer gave to Boys’ Life magazine, he was chosen out of a pool of about 100 dogs for his personality—and his impressive tricks. During the 1994 casting call, Soccer did a backflip that bowled over the producers. Admittedly, he had a great teacher. Soccer’s owner, Jackie Kaplan, was a seasoned dog trainer who also coached the Dobermans that chase Arnold Schwarzenegger in True Lies. 4. JENSEN ACKLES GOT HIS START ON THE SHOW. You can currently see Jensen Ackles on TV as Dean Winchester, one of the ghost-hunting brothers on Supernatural. His first television credit, however, came from Wishbone. Ackles got his big break playing Michael Duss, the preppy teen with a knack for “mechanical things,” in the season one episode “Viva Wishbone!” Check him out in the clip above. 5. AMY ACKER APPEARED IN THREE EPISODES. Similarly, one of director Joss Whedon’s favorite actresses got her start on Wishbone. Amy Acker (of Angel and Dollhouse fame) showed up in the book fantasy sequences of three different episodes. This gave her famous literary roles such as Catherine Morland from Northanger Abbey, Priscilla Mullins from The Courtship of Miles Standish, and even Venus from The Aeneid. Here’s her turn as that Roman goddess. 6. THE SHOW WASN’T JUST FOR KIDS. 7. MO ROCCA WROTE FOR THE SERIES. 8. THE VOICE ACTOR FOR WISHBONE GOT A CAMEO. Wishbone was voiced by Larry Brantley. The actor appeared in voice only throughout the series—with one exception. In the episode “Rushin’ to the Bone,” Brantley has a brief cameo as an actor named Larry Brinkley. This Larry is also dubbing for Wishbone, as he shoots a dog food commercial involving a fake Scottish castle and period garb. Sound familiar? Watch Brantley’s meta role above. 9. WISHBONE WENT ON A NATIONAL MALL TOUR. In between the first and second seasons of Wishbone, Soccer hit the road. He appeared in malls across America, greeting his fans from a red armchair. And his accommodations were none too shabby. While traveling, Soccer flew first class, stayed in four-star hotels, and had his own security detail. People noted that the handlers even gave Soccer a codename: The President. 10. THERE WAS A SPINOFF MOVIE AND SEVERAL BOOK SERIES. Wishbone was mostly an episodic kind of dog, but he did manage to score one feature-length film. Wishbone’s Dog Days of the West premiered on Showtime in the spring of 1998. It was based on the O. Henry short story collection Heart of the West, and it went directly to video soon after its television debut. One movie may be a slim filmography, but Wishbone’s bibliography is much larger: Between 1996 and 2001, there were nine different Wishbone book series. The first franchise, Wishbone Classics, consisted of straightforward novelizations of the TV series. 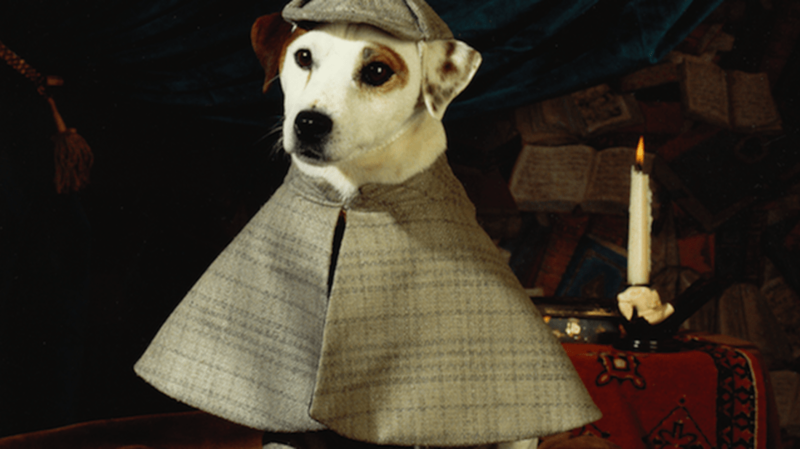 But soon there were Adventures of Wishbone, Wishbone Mysteries, and even Wishbone: The Early Years, a series that followed Wishbone as a puppy. The last spate of Wishbone books came in 2000 and 2001, all by the same author (A.D. Francis). You can get those now for literal pennies on Amazon.